Hair loses its shine and beauty over time. This is why it’s important to take care of it properly. Save the tresses before any permanent damage happens! 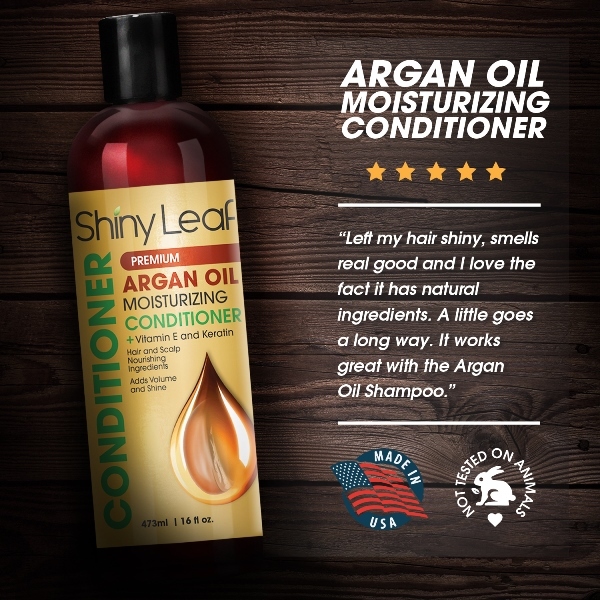 With Shiny Leaf Argan Oil Moisturizing Conditioner, revive dead locks to restore the bounce and shine of the hair. 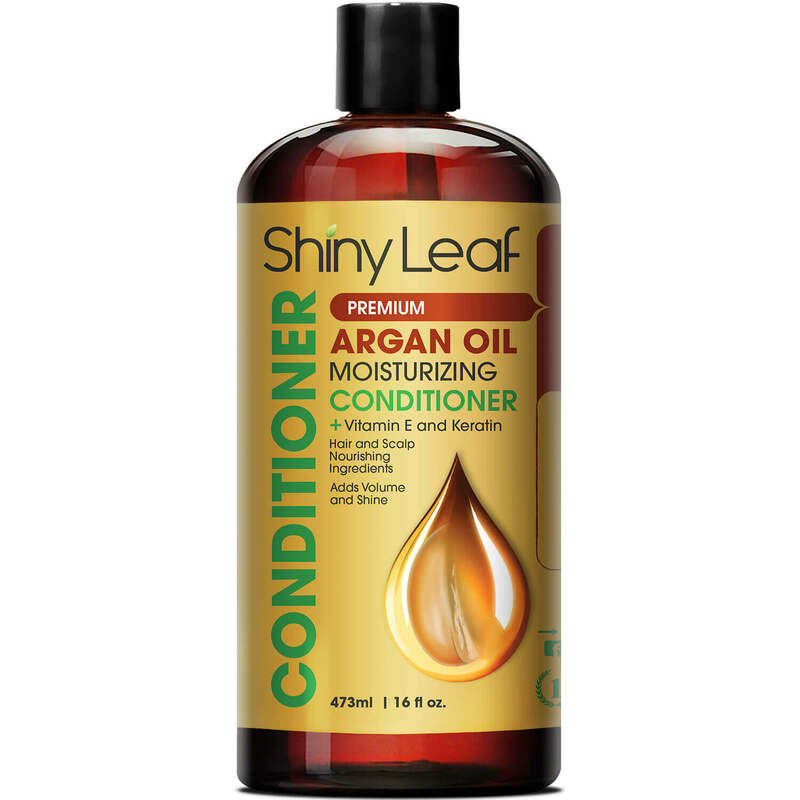 As one of Shiny Leaf’s best hair care products, using the conditioner improves hair with just a few washes. With Vitamin E and keratin, the tresses also gain strength and nourishment. Shiny Leaf’s conditioner has a gentle hair care formula. It nurtures the hair from the roots to the tips. 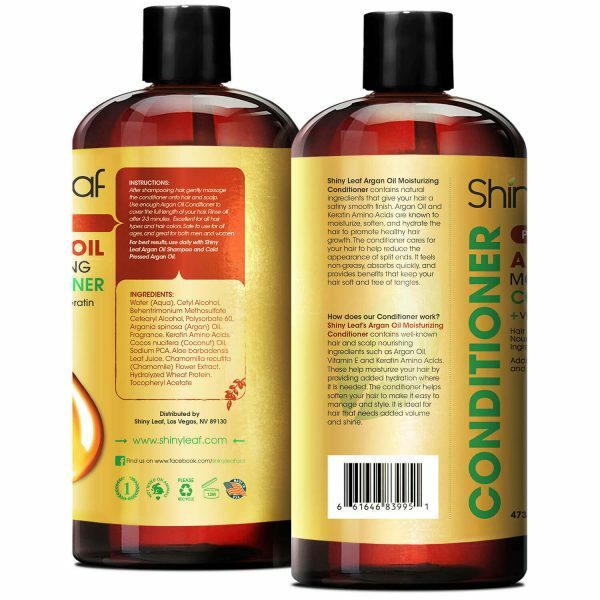 Regular use of this conditioner helps the scalp recover from any damages including the lack of moisture and hydration. This formula is made to provide rich moisture and vitamins to aid in the repair of hair damage. 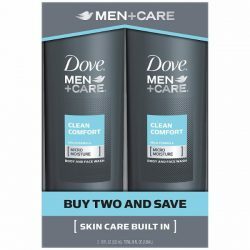 This conditioner replenishes the moisture on the strands to keep it soft all day long. The essential fatty acids in Argan oil keep the dryness away. It also improves the texture and gives the tresses a silky feel. What’s more, it aids in preventing problems from happening such as hair loss, breakage, and dryness. It contains keratin which is important for developing hair strength. High-quality organic ingredients also boost the effects of Shiny Leaf Argan Oil Moisturizing Conditioner. Get thicker and shinier locks with one wash! It locks in moisture to promote the improvement in hair volume and shine. 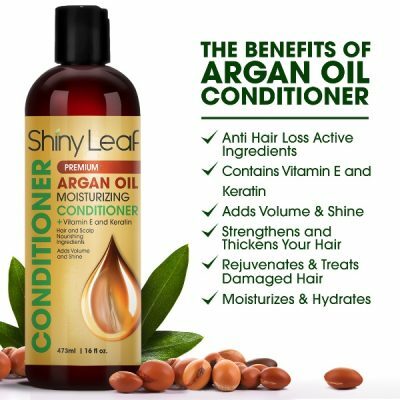 The infused Argan oil is of high-quality and it is rich in hair-nourishing compounds that help moisture last all throughout the day. The conditioner is easy to rinse off and does not leave any greasy residue. 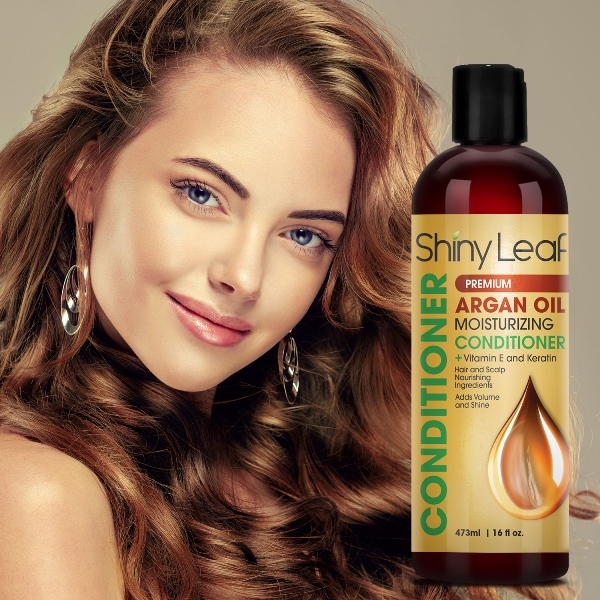 Shiny Leaf conditioner formula also keeps the strands tame and flowing to prevent split ends from forming. Use every morning or in every bath to keep hair free from tangles. Styling and handling hair becomes easier with the nourishing conditioner fashioned for added volume and shine! Formula designed for treating hair damages. Boosts hair volume and thickness. 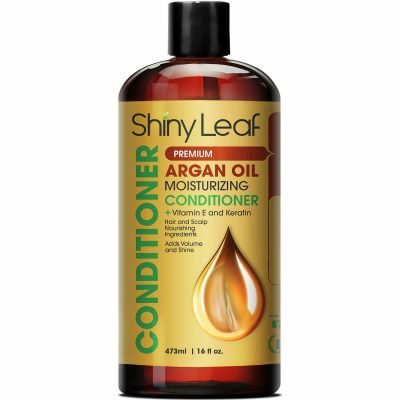 Gives hair an improved texture and shine. Moisturizes scalp and locks deeply. Treats hair damages and scalp conditions. Strengthens strands and boosts resilience against damages. Infused with Argan oil, Vitamin E, and Keratin. 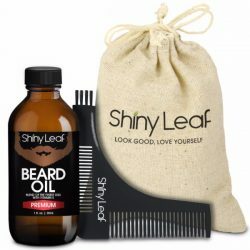 Contains natural ingredients for boosted hair benefits. For external use only. 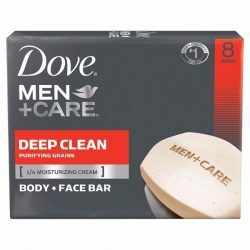 Use regularly to get long-lasting results. Apply the conditioner after cleansing the hair and scalp with shampoo. Squeeze out a small amount of conditioner into palms or enough amount to cover the entirety of your locks. Massage into hair and scalp for 2-3 minutes. Rinse with water after or leave in. 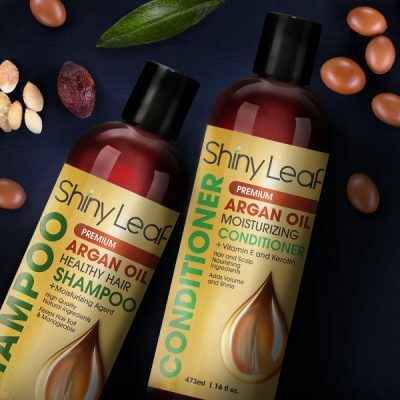 For great results, use together with Shiny Leaf Premium Argan Oil Shampoo daily. 473ml | 16 fl oz.